Richard Foltz holds a painting by his research assistant, Manya Saadi-Nejad, an expert — perhaps the only one in Canada — of this Iranian style. The subject here is a Persian fable that is related to the Indo-European pantheon of fables, including those of Aesop. In the Iranian version, Foltz explained, it has a political meaning. Kalila and Dimna, two wily jackal brothers, dispatch a bull, their rival, for the favour of the lion king. 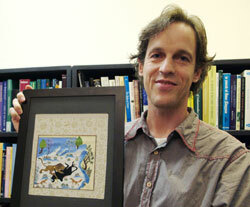 Richard Foltz set out to fill a vacuum when he wrote his latest book, Animals in Islamic Tradition and Muslim Cultures. “I developed a course on religion and animals a few years ago. I’m also a member of the Religion and Animals consultation recently established within the American Academy of Religion,” he explained. Drawing on a wide range of sources, including classic texts in philosophy, literature and mysticism, Foltz traces the development of Islamic attitudes towards animals over the centuries and confronts some of the key ethical questions facing Muslims today. In fact, he challenges them to live up to the claims their theologians make that Islam is superior to other religions in its respect for Creation. He taught a course in Religion and the Environment last term, and he says his class on animals inevitably comes down to vegetarianism: If we respect our fellow creatures, do we eat them? Foltz came to his specialty by a circuitous route. His first studies were in theatre, art history and cultural geography. He taught English as a second language in Kuwait, and when he returned to his native U.S., he focused on the Middle East, completing his doctorate at Harvard. Some of his previous books have been published in Japanese, Indonesian, Turkish and Arabic. His “bestseller” — 10,000 copies sold so far — is Religions of the Silk Road: Overland Trade and Cultural Exchange from Antiquity to the Fifteenth Century (St. Martin’s/Macmillan, 1999). “I think that’s mostly thanks to the fact that a lot of teachers have been assigning it, especially in world history courses,” he said modestly.